Q: I just won a SuperMac C500/240 on eBay. The maximum RAM for this machine is listed at 144 MB, but I saw 168-pin DIMMs that were 128 MB. Can I use 128 MB DIMMs to bring this machine to 256 MB? 272 MB? Where did the extra 16 come from? A: On your SuperMac, you have 2 RAM slots but also 16 MB installed on the motherboard. Your slots support up to two 168-pin DIMMs at a minimum speed of 60 nanoseconds and capacity of 64 MB each. The 16 MB from the board add up with the two slots and can give up to 144 MB of RAM. I wouldn't risk buying 128 MB DIMMs, since they are not supported. 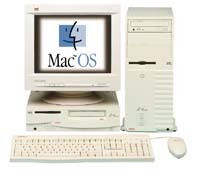 The chances of your Mac being unable to start up or being erratic are there. I personally saw people trying to use RAM that was not supported on their Macs, and it just didn't work out. You can always give it a shot, but there is no guarantee that it will work properly. In fact, asking about it on the SuperMacs email list turned up an interesting response: the memory works, but the computer only sees 64 MB, not 128 MB.